You can read the slides here. A recording of the presentation will soon be posted by InfoQ. A commercial friendly open-source license of the code will be available on May 22, 2010. Software methods can be viewed as the glue that holds the product development process together. With Kanban, the glue is melting on both sides of the process. Traditional portfolio management systems and organizations have difficulty coping with the granularity of Kanban. Likewise, today’s product release and delivery systems and the corresponding organizational constructs are ill-equipped to effectively handle the Kanban flow. We present a field-tested system for implementing Kanban on an end-to-end basis – from product ideation through continuous delivery. This system reformulates the deconstructed product delivery process to strike an optimal balance between planning, development and operations. 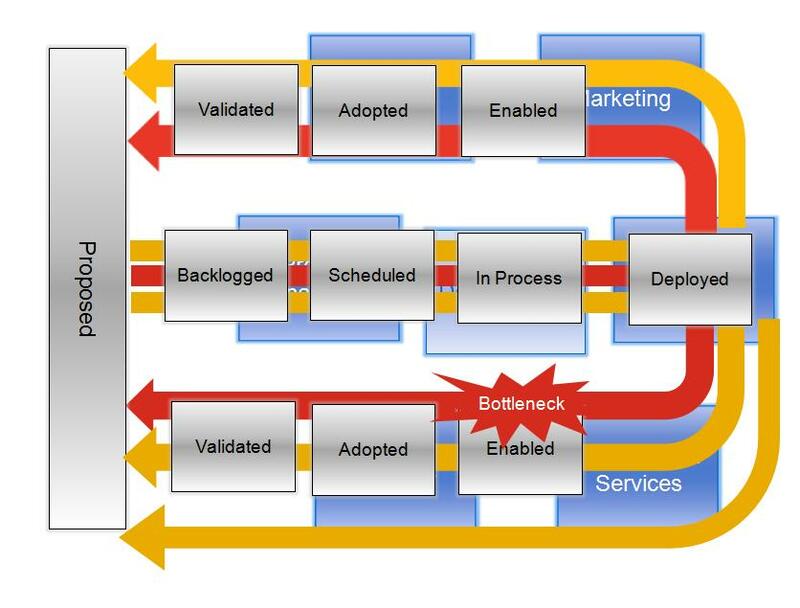 A fascinating difference exists between Agile and Business Service Management (BSM). Agile emphasizes continuous flow of value to the customer. In contrast, BSM focuses on the business – it aligns the deliverables of IT to the enterprise’s business goals. Subtle that the difference might be, the two methods evolved along quite different lines in spite of the common denominator – dealing with software. In this guest post, Alan Shalloway – Founder and CEO of NetObjectives – discusses the implications of focusing on the business as distinct from focusing on the customer. His discussion is part of a few thought-provoking threads he weaves around the Agile Manifesto. Alan perceives the Manifesto a product of the times. He thinks aloud whether today’s circumstances require a revised manifesto. Alan is a man of passion. While I do not always agree with him, I have a lot of respect for his quest to find the deeper truths. Furthermore, I always learn from him. Whether you agree or disagree with the opinion Alan articulates in this post, “listening” to his thoughts is well worth your time. The manifesto represented a new paradigm from which to work – one in which the team would have better control over its destiny and where it was recognized that one had to make incremental, iterative movement towards one’s goals – both in discovering the true goal and in implementing it. Unfortunately, the perspective from which the manifesto was created, or at least the methods which first followed the manifesto, have been extremely team centric. Not a surprise, given the paradigm at the time gave development teams too little say in their own methods. The impact of this has been, not surprisingly, success at the teams and difficult beyond the team. It is almost axiomatic now that companies will have successful team pilots only to bog down in their enterprise agile adoption efforts or even revert back to earlier methods. It could also be said that the driver for agile development is misplaced. I do not believe “Our highest priority is to satisfy the customer through early and continuous delivery of valuable software.” This makes software groups customer driven, not business driven. ﻿﻿﻿There is a subtle, but important difference. Basically, conscious or not, the Agile Manifesto is driven with a team-centric view of satisfying customers – business and management play mostly secondary roles. 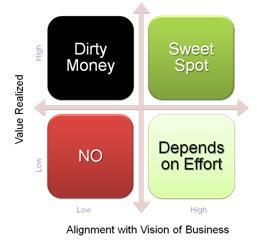 Unfortunately, there is a significant difference between customer driven and business driven (see the figure entitled Alignment with Vision of Business to the right). This is not apparent at the team level (the team is supposed to satisfy the customer). But definitely at the business level. Not surprising, however, since the manifesto is a team perspective it states things in terms of customer value. Ironically, it is the over-focus on the team, however, that is robbing teams of one of their greatest tools. Clearly any method must have respecting people and providing those doing the work the ability to choose how they do their work. But this does not mean that process isn’t essential or that attending to certain laws of software development is optional. Rather it means that process can’t be imposed on teams since to do so would both rob them of respect and almost certainly be the wrong way to do things – who knows more about how to get work done than the people doing the work themselves? But “Individuals over process” as the first line has come to be called, makes it sound like people are it. I do not think so – and I think this mindset has caused a lot of damage in many ways. There is great evidence that the best approach is not merely get smart people onto a team and have them figure out how to solve their problems. They must be properly equipped to do so. Just being smart doesn’t mean you can solve the challenges facing you. This should be readily apparent, but in many ways, the Agile community has mostly ignored it. Actually, there is not really an Agile community any more – there are factions that have significantly different beliefs. For example, XP has long recognized the need for technical practices in Agile while the Scrum community is only just starting to get into what these are. However, except for the Lean/Kanban community, few Agilists seem to espouse discovering and following the laws of product development flow (or even recognize their existence). This, in my mind, has led to the low rate of success in scaling Scrum to the enterprise*. Ironically, it is the over-focus on people that leads many in the Scrum community to assert this lack of success is a lack willingness to take the effort to improve. This is not surprising – if it’s up to the team to succeed, then when they don’t it must be something wrong with the team or their management when they fail. I think not. I think it is the lack of understanding of the principles of software development flow. These laws are not new. Don Reinertsen, in his iconic book Managing the Design Factory lays out much of the rules of product development. His more recent book The Principles of Product Development Flow: Second Generation Lean Product Development he lays out 175 of these principles. To me, true respect for people means that one must equip them with what they need to get their job done. Our thinking in the Agile community should change from “People over process” to one of “People times process.” This phrase emphasizes that if either are low, you get a low productivity. Process does not ensure success. But a poor process requires heroes to succeed. We’d like good, motivated, well-intentioned people to be able to succeed. Our new agile perspective needs to include an understanding of what teams need to know to do their work. This opens up a role for managers to actively help teams get their job done and to coach them when they have challenges or lose their way. While I will always be thankful for the Agile Manifesto, I am looking for a Business Agile Manifesto that will expand the focus from the team to the entire enterprise. This quip by Angelo Mozilo, founder of Countrywide Financial, led me to coin the term “toxic code.” The code stops being an asset when it accumulates technical debt equal to the value it is expected to generate. As matter of fact, the code could become a liability when the cost to “pay back” the technical debt exceeds the revenues the code would generate. Such situations have been known to happen more often than we might realize. They occur, for example, when numerous customers develop elaborate business processes around poor quality enterprise software. Technical debt had originally been conceived as an expediency measure – “a little debt speeds development so long as it is paid back promptly with a rewrite.” However, like financial debt, unrestrained borrowing can lead to a broad spectrum of difficulties, from collapsed roadmaps to inability to respond to customer problems in a timely manner, and anything in between. Recent advances in source code analysis enable us to quantify technical debt and express it in $$ terms. By so doing, the software development process can be governed with unprecedented effectiveness. It is possible to constrain the “development on margin” mal-practice and avoid the toxic code phenomenon: technical-debt-to-value ratio of 100%. Moreover, even toxic code can ultimately be “marked-to-market” by reducing/eliminating technical debt. In the course of managing software development in this manner, your team will improve its design, coding, testing and project management skills. Ultimately, these improvements are the best antidote against accrual of technical debt in the future. In the podcasts around here and Israel’s posts we often talk about using cloud computing as a tool to deliver better software – indeed, to better the software delivery process. Those two angle on cloud computing are what I tackled in a recent presentation (given as a keynote at the Philly Emerging Technologies for the Enterprise conference last week). As I said in the talk Agile development thinking is a great start for figuring out how to take advantage of cloud computing. You can see a rehearsal recording of the talk over at my blog (or click play on the above) or hear an audio-only recording of the actual talk over at the Chariot TechNetCast, here’s the slides. Can Technical Debt Constitute a Breach of Implied Warranties? Cunningham’s quip “A little debt speeds development so long as it is paid back promptly with a rewrite” is intuitively very clear. We are talking about short-term debt which will be reduced, and hopefully eliminated in entirety, at the earliest possible time. The question this post addresses is what happens when the expected short-term technical debt becomes a significant long-term debt? 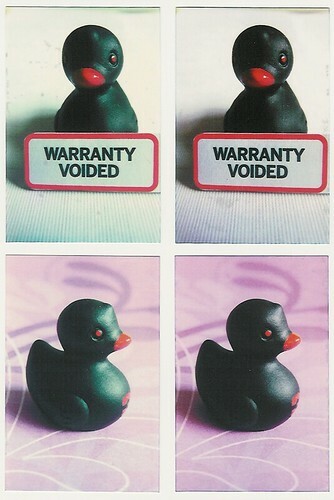 Specifically, can technical debt under some conditions constitute a breach of implied warranties? As a reaction to seeing this condition and its deleterious effects, I coined the term technical fraud to refer to the practice of incurring unmanaged and hidden technical debt. Many U.S. states have “lemon laws” that make it illegal to knowingly sell someone a car that has undisclosed maintenance problems. Selling a “lemon” is a fraudulent practice in the world of cars, and it should be considered as such in the world of software. It is a little tricky (though not impossible – see Using Credit limits to Constrain Development on Margin) to define the precise point where technical debt becomes “unmanaged.” One needs to walk a fine line between technical/methodical incompetence and resource availability to determine technical fraud. For example, if your code has 35% coverage, is it or is not unmanaged? Does the answer to this question change if your cyclomatic complexity per class exceeds 30? I would think the courts might be divided for a very long time on the question when does hidden technical debt represent a fraudulent misrepresentation. One component of technical debt deserves special attention in the context of this post. I am referring to the conscious decision not to do unit testing at all. Best I understand it, the rationale for not “bothering” with unit testing is a variant of the old ploy “we do not have time for testing here.” It is a resource allocation strategy that bets on the code being miraculously bug-free. Some amount of functional testing is done out of necessity – the code in customers hands needs to function as proclaimed. But, the pieces of code from which functionality is constructed are not subject to direct rigorous testing. The individual units of code will be indirectly exercised in some manner through functional testing, but not in a systemic manner to verify and validate correctness of the units of code per se. To #1 defense open to a software vendor who gets sued over lack of unit testing is that a fair average quality of software can be attained without any unit testing. As a programmer, I would think such defense would fly at the teeth of the availability since 1987 of the IEEE Standard for Software Unit Testing. Disclaimer: I am not an expert in the law. The opinion expressed in this post merely represents my layman’s understanding of principles of contract law that might be applicable to technical debt situations.